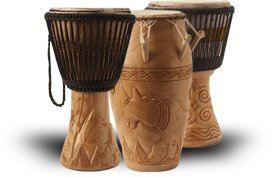 By the Waves Foundation (BTW) began in 1996 with a trip to Ghana, West Africa and the unlikely friendship between an American doctor from the Mayo Clinic and Kofi, a Ghanaian drum builder, musician, and band-member in the afro-reggae band “Unity”. Today BTW is a “drum circle” of friends, musicians, filmmakers, and entrepreneurs working together with a single mission: to help preserve the cultural identity and heritage of communities through the arts, music, and education. Led by Kofi, our work has already begun at KOFI’S DRUM WORKSHOP in Accra and will continue in the Fall of 2013 with the opening of the MUSICAL VILLAGE FOR ORPHANS on the shores of the Volta River in Eastern Ghana.